Reading is fundamental...right? So, we decided to incorporate reading in our every day journey with our little one. For awhile, I would read three to four pages per week for my little one and then I realized that she loved (absolutely) LOVED reading. So, we visited our local Texas Public Library and we discovered then.... 1,000 Books Before Kindergarten program! So, I forgot to admit that we actually began this journey.... three months ago. 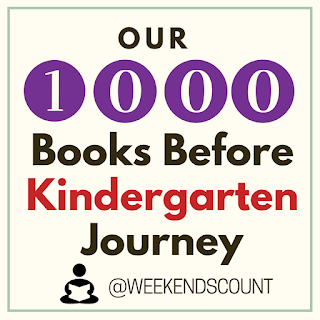 Yes, we are truly catching up to this 1,000 book program to make sure that our little one is able to proudly state that she read 1,000 books before kindergarten! Here are some easy ways to incorporate the 1,000 Books Before Kindergarten program TWELVE months before your little one begins kindergarten in public or private school. In fact, these are great tips for homeschooling moms and dads as well! 1 - Make Reading a Big Deal in Your Household! Make sure that you have a little reading area for your little one in the living room, your home office, or their bedroom/playroom. These reading nooks are essential for helping your little one feel at ease with reading. Make sure that you visit the local library for your beginning books. Let your child discover the books and categories that they would like to read. After you discover your child's interest, then incorporate these books on a daily basis! Our local Goodwill store has been essential for our family's preschool book collection. Cheap books are important for your children (just in case your little one wants to read a book each night). Yes, gather your books together and swap these books with other families via a Facebook book exchange or via your local playgroup or church. Through the book swap method, your little one can read more books in less time. Plus, this method will save you money! We order books from Amazon Warehouse Deals on a frequent basis. These are books that are slightly damaged or used, but are in great condition for our preschooler! Here's our affiliate link for the Amazon Warehouse Deals store. Usually, books in this store are 50% to 70% off! Our little one loves her toys and her grandparents definitely like adding to her collection. Unfortunately, our house can only hold a few toys at a time. Therefore, it is important for our family to know that books are appreciated MORE than toys! Plus, books are a little more economical! When we travel to a hotel or to Disney World, it is important to have books for my little one's nightly reading adventure. So, instead of packing eight (8) books, we subscribe to Amazon's Kindle Unlimited program and this helps us pack more efficiently, while incorporating learning-on-the-go! Here's our affiliate link for the children's books in the Amazon Kindle Unlimited store. Please let us know if you have any questions about Amazon Kindle Unlimited. We love it! 10 - Make a Digital List of Your 1,000 Books Before Kindergarten by Creating an Amazon Wish List! We love Amazon for purchasing items and I love it EVEN more when we can utilize it for a learning resource! We created an Amazon Wish List to scan the book barcodes and to capture our running total number of books. This is also a great way to gain suggestions for future books to order or to request from the library.